Everyone (who is everyone, really?) says print magazines are so over. Dead. Morte. It’s all about the online space. Sorry, but I still adore magazines. I prefer to hold a magazine in my hands rather than read the same content on the computer/iPhone. 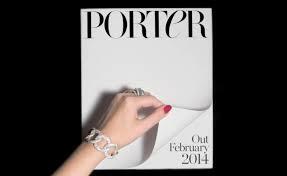 I’m very curious about the new magazine, PORTER, from the online powerhouse, Net-A-Porter. They didn’t have to create a print version of the magazine. I’m glad they decided to. It’s interesting that PORTER will shoot clothes by designers that are not available on Net-A-Porter, such as Chanel. To me this (along with feature articles about traveling, design, the arts, tech, etc. ), sends a clear signal that PORTER is going to be a proper magazine, not just another venue for online shopping. It will be sold in sixty countries. While the company is based in London, the magazine is written in American English. Given the consistently awful news about the state of print media, I’m excited to see Net-A- Porter take this risk. I cannot wait to get my hands on it. Arlene, you should include a feature to tweet and facebook for column. I love your column and would share it every week. At the bottom of the posts there are icon buttons for sharing via Twitter, Facebook, etc. Thanks for reading and for offering to share my random musings. There’s nothing like turning a page, smelling an image, inhaling words.. A friend has just gifted me a LRB subscription and I love it – papers and books all over the breakfast table! I actually held on to some of my magazines when I moved to Italy. I couldn’t keep every back issue (tears) but my friends thought it was nuts to bring any.